takes the cake! 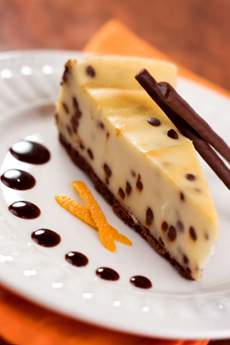 Like cheesecake? Enter this week’s Gourmet Giveaway: The lucky winner of our cheesecake prize will get to enjoy a 10-inch deluxe cheesecake sampler. You’ll get two slices each of eight flavors: Amaretto, Chocolate Chip, Chocolate Fudge, New York Style, Blueberry Swirl, Raspberry Swirl, Cappuccino and White Chocolate Pistachio. Retail value $52.99. This and other gourmet gifts are available at DelightfulDeliveries.com. Enter the Gourmet Giveaway by answering a few fun trivia questions about cheesecake; you don’t have to answer correctly to win. Find more of our favorite gourmet cakes in the Cake & Pastries Section of THE NIBBLE online magazine.